These guidelines outline procedures for cleaning (sanitizing) and disinfecting cushioned abrasive files, buffers and blocks. In the salon, these implements must be properly cleaned and disinfected before it comes into direct contact with a client, as required by the licensing rules and regulations of your region, state or country. Be sure to check with your local, state, and federal regulations regarding proper sanitation laws if these products will be used in a salon. After cleaning, disinfect by immersing in (or saturating with) 70-90% isopropyl* or ethyl alcohol for 5 minutes. * Some disinfectants are designed for use on hard-surfaces while others are best used on porous or absorbent items. EPA-registered Hospital disinfectants are good examples of a type that is suitable for hard surfaces such as metal, glass, fiberglass or plastic. Isopropyl alcohol and ethyl alcohol (70 – 90%) are suitable for porous/absorbent items such as scrub brushes for nails, cushioned abrasive files, buffers and blocks. Refer to: “Guidelines for Cleaning and Disinfecting Manicuring and Enhancement Equipment” for exact wording. 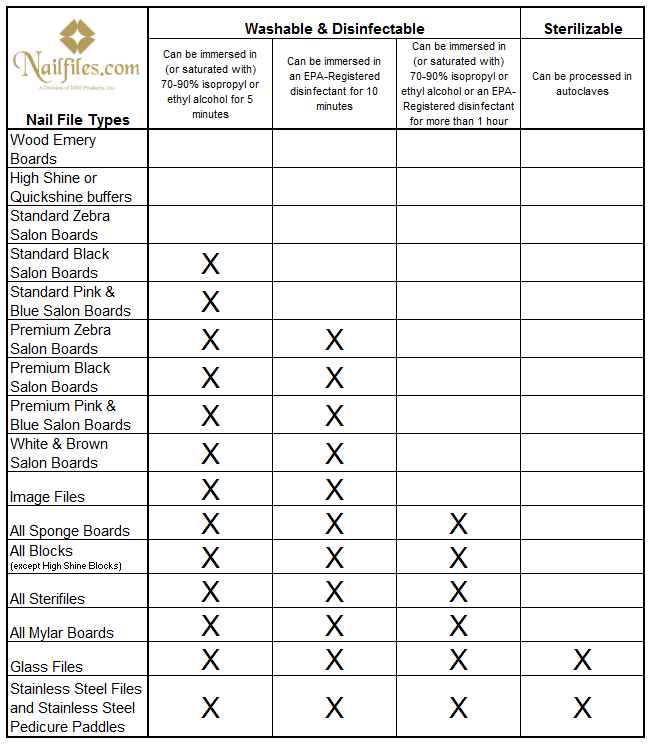 It is a free hand-out from the Professional Beauty Association and the Nail Manufacturers Council.